A new law opens the door for Mississippi Electric Cooperatives to study how to bring the internet to rural communities. But as MPB's Desare Frazier reports, it could be years before the service is available. 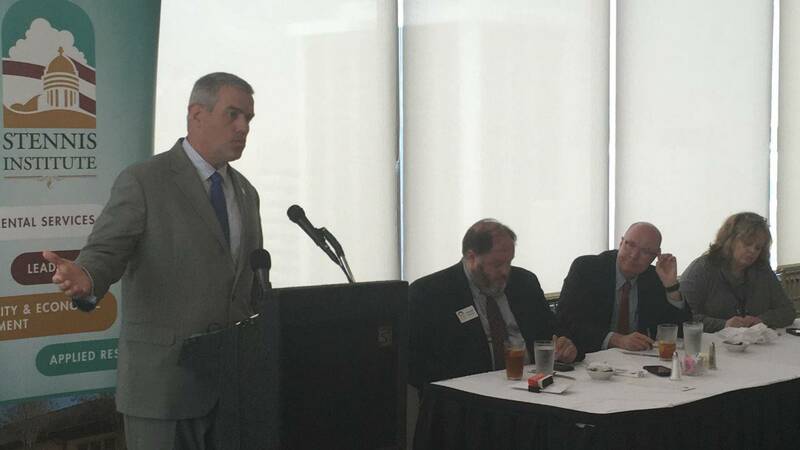 At a press luncheon in Jackson, Mississippi Speaker of the House Republican Philip Gunn talks about a new law that allows electric cooperatives to provide broadband to rural areas. He says the costs is a major obstacle. Gunn recounts what a utility company employee said to his boss after reviewing the price tag. "He said I got two proposals for you. If we run service to those six houses it's $300,000 for us. But if we pay to move those six houses into town, it's only $200,000 for us," said Gunn. The law allows cooperatives to partner with other coops or internet service providers to share the costs. David O'Bryan with the Delta Electric Power Association says they're looking at creative options because it's so expensive to install fiber optics. Delta Electric covers portions of 13 counties including LeFlore, Bolivar and Montgomery. O'Bryan says the U.S. Department of Agriculture is providing $600 million in grants to rural areas nationwide. "I think the cost in Mississippi alone is well over a $1 billion for the electric coops to do this. So the $600 million is really not a lot of money," said O'Bryan. Public Service Commissioner Brandon Presley, is pushing cooperatives to find ways to provide the service. "The same question was there when electricity was being put in and we solved that problem through rural cooperatives. We can do the same with internet service. It is being done in 107 placed in America and many places more rural than Mississippi," said Presley. David O'Byran says it can take more than a year to study the economic impact of providing the service. Then he says he can take 6 to 10 years to phase it in.